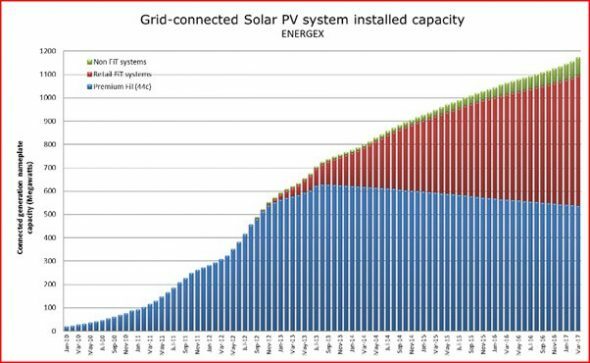 Energex have released their monthly update of solar installations in south-east Queensland and it appears the number of consumers enjoying the grandfathered ‘premium’ feed of 44c/kWh has finally been overtaken by those with the ‘regular’ retail rate of 6c/kWh. Released this week, the data shows Queensland has 1,174MW on 325,164 homes and businesses – the highest in Australia. 172,753 and 539MW of these consumers are still on the premium feed, which is lost upon a change of system or ownership. At its highest over 600MW was being generated at the $0.44c/kWh tariff. The government would be keen to cease as many of these premium feeds as possible before the agreement runs out in 2028 – as currently they’re paying 730% of the ‘normal’ rate. This isn’t as much as Victoria where the tariff was a whopping $0.60c/kWh! According to Newsmaker, Solar PV market size for both residential and industrial sectors will exceed 5 million units by 2030 – to total around 16GW. There are currently around 1.6 million, with a combined capacity of over 5.7GW. (You can find a great deal of useful and detailed data on the Australian PV market from the Australian PV Institute.). Of particular interest is the fact that QLD has the highest monthly PV output by a considerable amount due to generous schemes by the government – and the Northern Territory outputs only 6,281MWh per month (opposed to Queensland’s 172,121MWh). If you want to read more about Solar Power in the Northern Territory we have a page discussing its slow uptake in more detail. If you’re interested in Solar at your home, some of the major competitors worth checking out (a few don’t operate in Queensland) include Jemena, United Energy, CitiPower and Powercor Australia, ActewAGL, AusGrid, Energex, Horizon Power, SP AusNet, Essential Energy and Ergon amongst many others. Solar is growing at an amazing rate and as the cost of equipment and subsequent cost of MWH continues to lower it’ll become bigger and bigger. As the uptake of solar PV systems begins to even out it’ll be time to start looking at ‘smart’ energy storage – which will be able to predict trends based on househould usage habits, weather patterns and so on – with the aim of minimising your electricity bill. Have a look at our article on Redback Technologies’ Energy Management Platform for more information.